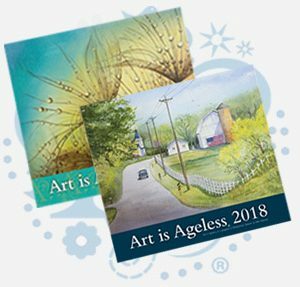 Since 1980, Presbyterian Manors of Mid-America has been hosting the Art is Ageless® competition and exhibit at each community for residents and area artists who are age 65 or older. The contest and exhibits are open to amateur and professional artists. Artists may enter up to three pieces in the nine categories, but no more than two in a single category — Christmas or winter holiday, drawing, fiber arts, mixed media and crafts, needlework, painting, photography, quilting and sculpture/3-D work. Works which have recently won in Art is Ageless local competitions may be exhibited but are not eligible for judging in the juried competition. First-place works in each category, Best of Show and other pieces identified by the community marketing director, may be shipped to Presbyterian Manors of Mid-America’s Corporate Office in Wichita, Kan., to be photographed and judged for the Art is Ageless calendar and greeting cards. For complete rules, visit the Rules page. To enter, visit the Enter page and either download and complete the paper entry form or complete the online form. Entries must be transported or shipped to the local Presbyterian Manor of Mid-America community for judging and exhibition. Use the link below to find a list of communities, entry deadlines and exhibits, or check our Calendar of Art is Ageless events.